Congratulations to Fucked Up, the winners of the 2009 Polaris Music Prize for Best Canadian Album. In case you’ve never seen Fucked Up live and you live in NYC, you’ve got a primo chance to see them play coming up very soon. 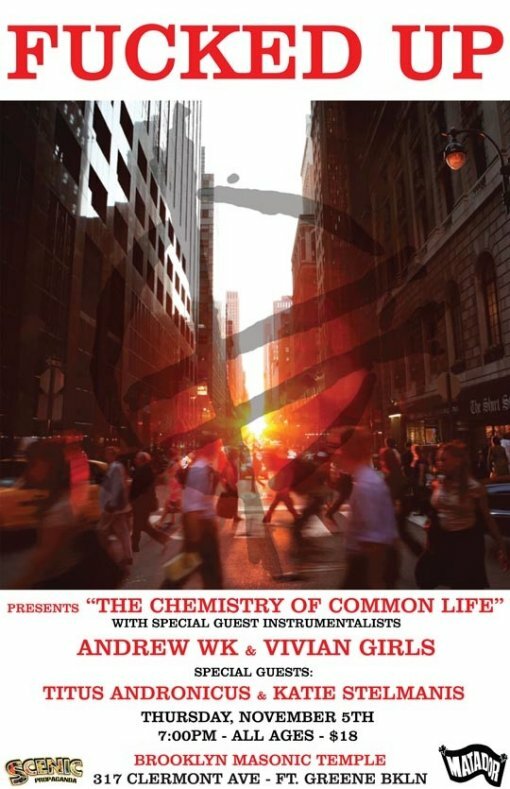 They’ll be performing the award winning The Chemistry of Common Life live and in its entirety at the Brooklyn Masonic Temple on November 5, 2009 with special guests Andrew WK, Vivian Girls, Titus Andronicus and Katie Stelmanis (Buy Tickets). It was a historical night of music that featured performances from all of the nominees, Elliott BROOD, Fucked Up, Great Lake Swimmers, Hey Rosetta!, K’NAAN, Malajube, Metric, Joel Plaskett, Chad VanGaalen and Patrick Watson. MuchMusic captured all the excitement on camera. You can watch this Saturday, September 26 @ 9pm ET and again at 12 midnight. Encore presentations will air on Friday, Oct. 2 at 9 p.m. ET on MTV2 and Monday, Oct. 12 at 10 p.m. ET on Bravo! You can also relive the event in all it’s radio glory by downloading the CBC Radio 3 podcast on iTunes starting at 8am tomorrow.